My mission is to carry the Project Healing Waters message to flyfishermen in all 50 states. This is a second life for Gilbert The Gold-Ribbed Hare's Ear Nymph . This time it is a laminated business card with the tracking code displayed prominently on the face of the card and a message on the back. In the first life, this travel bug was a piece of paper inside a film canister, yellow body, red top, attached to an actual TB. I launched Gilbert the first time in West Yellowstone, MT in September 2010. It disappeared with no log entries. I pulled back the travel bug number and relaunched Gilbert in GC4652A,The Camo Bug Inn in Titusville, FL on 09 Mar 2014. I guess there is some slim chance that the original might show up. 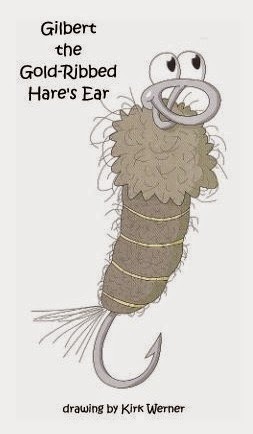 The Gold-Ribbed Hare’s Ear Nymph is probably one of the most popular nymph patterns in all of fly fishing for two reasons: it works, and it’s easy to tie. There are some flies that just have an inherent 'fishiness' about them. The Gold Rib Hare's Ear is one of those flies. A non-descript, buggy compilation of fur and feathers, the Hare's Ear won't win any beauty contests, but is one of those flies that you may never want to be without. It is a very old pattern and has certainly been around for over two centuries. Gilbert is one of twelve characters created by artist Kirk Werner for three books designed to introduce children to fly fishing. I have created a Trackable for each character. 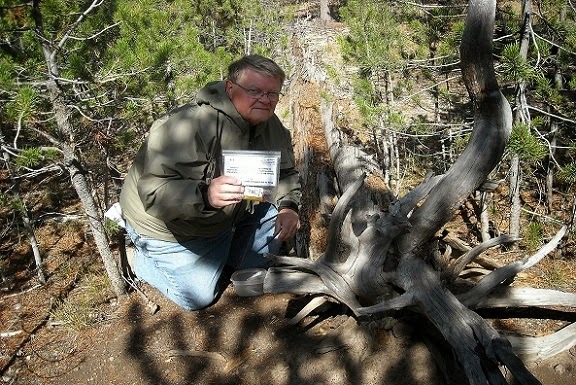 If you would like to see them all, here are the Geocaching Travel Bug Numbers: TB3E3X5, TB3E3Y2, TB3E3X7, TB3F6AD, TB3F69B, TB3F6AW, TB3F69V, TB3F69Z, TB3F6AV, TB3F6A3, TB3F6A5, TB3F6A0.